In this video, we are going to solve equations with a radical expression. If there are other values in the equation, then first isolate the before squaring both sides of the equation. 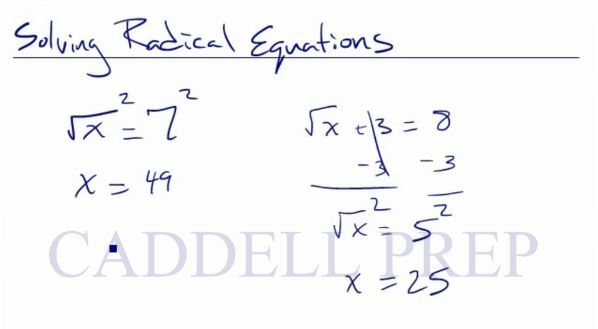 Let’s go over how to solve equations with a radical expression. In order to solve for , we have to get rid of the radical sign. The inverse of a square root is squaring. we want to get the radical by itself first. And the last step is to square both sides. Again, we want to have the radical by itself. Let’s add on both sides. Here, the whole term is under the radical, so it is already isolated. So, we’ll start by squaring both sides. Now, let’s solve for . In the second part, we are going to solve equations with a radical expression that are more complex. If it was -7.8 instead of 7.8, then it cannot be a negative answer since the square root of a negative number is imaginary. In this case, the final answer would just be 3.2. 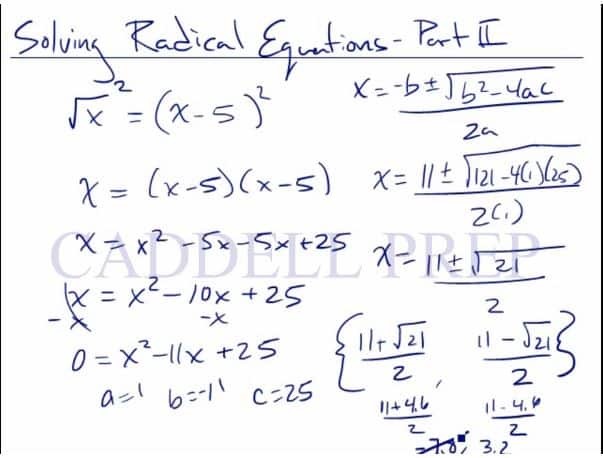 This is how to solve equations with a radical expression part 2. It’s a little bit different because we have on both sides. Here, we want to get the radical by itself first before we combine the together. In order to get rid of the radical, let’s square both sides. Now, we have a quadratic equation. We want to get all the terms on one side so the other side be zero. This can not be factored so let’s just use the quadratic function to solve it. What is important here is that we always want to make sure that we won’t end up with a negative radical. If one of the answers come out as a negative, that’s a rejected answer. The only answer we accept is a positive number. Because you cannot find the square root of a negative number. So, you always have to check and make sure that you don’t have a negative number under the radical.